Do you remember being 13 years old? I sure do. For me, my thoughts centered around my friends and the boy that I had a crush on on that particular day. And as my teenage diaries would tell you, that was a revolving door, though I didn’t dare tell any of my friends out of fear that the “boy of the moment” would find out! Turning 13 is a big deal. I recently saw pictures from my 13th birthday party, circa 1998, where I invited around 10 of my friends over to my house for a sleepover (God bless my parents!). We have smiles (some with braces!) on our faces and ponytails pulled back with scrunchies, basking in the naivete of teenage awkwardness. I also have a random memory from a friend’s 13th birthday of watching Jennifer Lopez dance on a webcam in her music video for “If You Had My Love.” This was back in the days of TRL and when they actually played music videos on MTV. Many things have changed since 1998, but one thing remains the same–turning 13 is a big deal. I made this beautifully colorful cake at the request of a mother who was throwing her daughter a “Under the Sea” birthday party. 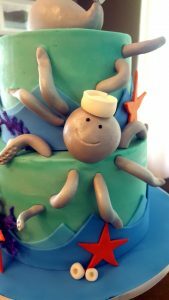 She was turning 13 and this was a special party, which called for a special cake. 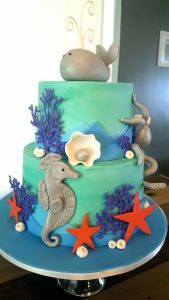 The birthday girl had a specific vision in her head for what she wanted her birthday cake to look like, right down to the colors of the coral and starfish. I loved the colors on this one! The cake of choice was red velvet with vanilla buttercream. The outside was frosted in vanilla buttercream colored a bright bluish-turquoise. 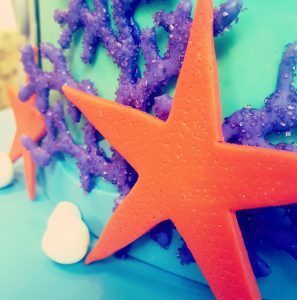 The waves, clam, starfish, and white coral were all hand cut and formed out of fondant and I made the purple coral with royal icing that I sprinkled with purple sanding sugar to add some texture to the cake. 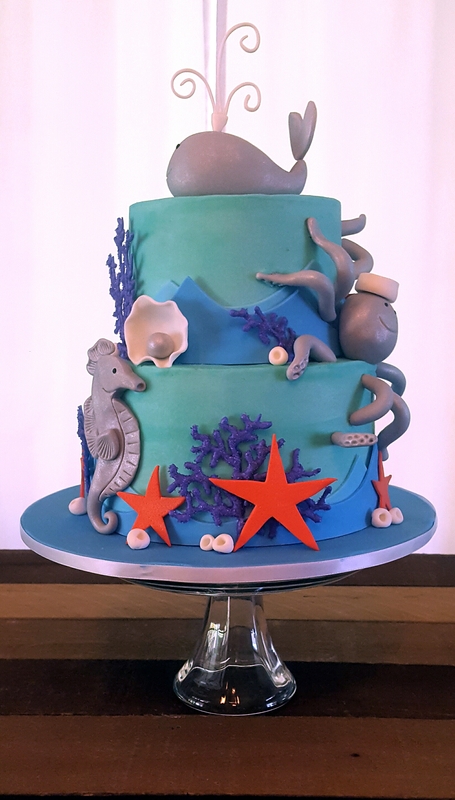 I molded the sea creatures out of a fondant and gumpaste mixture and absolutely love how they turned out! I always enjoy hearing the response when people see their custom cake and this time was no different. Mom was thrilled and birthday girl loved the cake. That’s all I needed to hear. Anything else is just a bonus! I was so happy to help make a 13 year old’s birthday party the special event that it deserved to be! I am overwhelmed by the beauty of this cake! Buddy the “Cake Boss” couldn’t have made this any finer himself! What a beautiful creation.